A few years ago, the Lejuc Woods were picked as the site for ventilation shafts into the proposed underground burial vaults for France’s commercial and military nuclear waste. In the summer of 2016, when the nuclear waste authority ANDRA illegally walled off a construction site in the woods, dump opponents forced them out and began their own occupation. Since then, activists have planted crops and established residency in treehouses and watchtowers to protect the communal woods. While title to the property remains in dispute, last summer a court ordered the eviction of the new community, providing police with the authority to act now. To isolate the resisters from their supporters, police blocked roads leading into the woods while arresting activists in the lookouts and surrounding their treehouse homes. As news of the raid spread, cars approaching from several nearby villages were stopped for identity checks of the drivers and passengers. 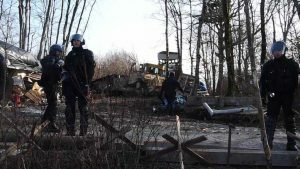 The streets in the village of Bure were blocked as police also surrounded the House of Resistance, where local opposition to the national project has been based for more than 20 years. At least 30 occupants took refuge upstairs as police broke down the door to enter. Some locked themselves together and had to be cut apart, but over the next few hours, all of the occupants were escorted out while police searched the building. Many were taken to surrounding police stations for identity checks. At the end of the day, five people remained in police custody. A joint press communique from nine of the groups opposing the dump condemned the raid and the hypocisy of the government. While Environment Minister Nicolas Hulot had declared that dialogue, not “force and brutality,” would mark the way forward on the dump question, he sent the groups a disingenuous invitation just the day before to meet with his deputy Sebastien Lecornu, due to arrive in the region on the evening of the raids for consultations in the Prefecture of Bar le Duc the next morning, February 23. “Who is illegal at Lejuc Wood? The occupants of the forest who built a barricade against a project insane and questioned from all sides, or the authorities who by this incomprehensible evacuation supports this project? These raids are the latest escalation in ANDRA’s effort to get a hole in the ground. They come after recent convictions of dump opponents arrested during earlier clashes with police, who face a possible jail sentence next month. A recently announced information tour to begin discussion with supporters around the country during the last week of February now takes on more urgency, as does the recent call for people to come to Bure during the first weekend of March to help prepare the camp in the woods for actions this summer. For more information, visit http://en.vmc.camp/2018/02/22/expulsion-forest-info-thread/. 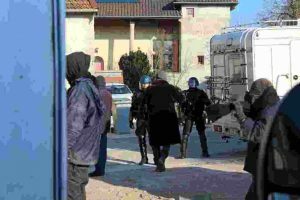 Amidst what one writer called “a quasi-colonial control of the territory,” two people have been jailed since February 22 in the Meuse district of northeast France. They were arrested during the largest police operation there to date, following months of escalating state action against opponents of a planned underground burial dump for France’s high-level nuclear waste. They were initially held in police custody for refusing both DNA sampling and an immediate court appearance before they could review the charges against them. In court on March 19, the two jailed activists each received a prison sentence of three months. Several other court proceedings are underway over the next months. At least two people now await sentencing in April for conviction on charges resulting from the initial occupation of the woods in August, 2016. The first wave of repression, including helicopter surveillance and frequent road blocks and ID checks, crested last September. See details here. 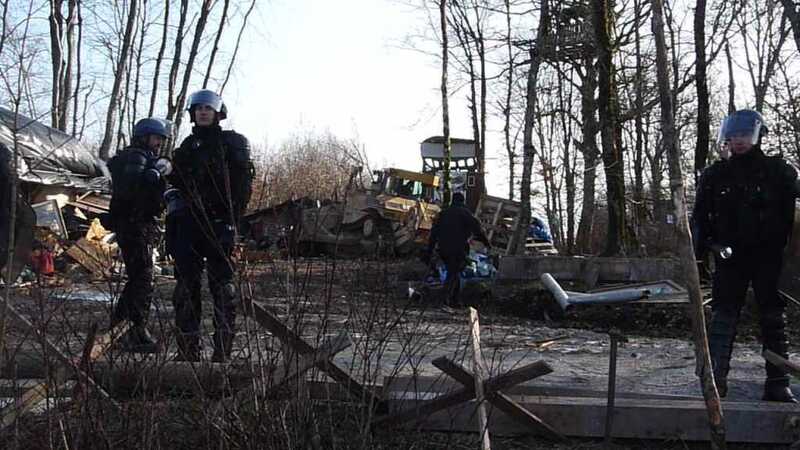 A week before the September raids, a court in Bar- le-Duc found local farmer Jean-Pierre Simon guilty of lending his tractor and a trailer for use by the activists occupying the forest. On October 24, he was sentenced to two months in prison, suspended. Police had seized his equipment 15 months earlier, but because Simon cannot redeem it if he appeals the verdict, supporters quickly raised €7,000 to replace it. Police mounted a large operation to evict the owls on October 20 but were held back when the activists set fire to barricades they had built on the roads entering the woods. Prison information is available for one of those now jailed. Letters of support should be sent to Crystal Antem at the address found here. For more information, visit vmc.camp. A chronicle in English of the last two years of nuclear dump resistance can be found in the pages of the Nuclear Resister newsletter from issues #182 (September 6, 2016), #184, #185 and #186 (download at http://www.nukeresister.org/back-issues/).